When the abdominal wall excursion during inspiration, expiration, or both do not maintain optimum ventilation for the individual, the nursing diagnosis Ineffective Breathing Pattern is one of the issues nurses need to focus on. It is considered the state in which the rate, depth, timing, and rhythm, or the pattern of breathing is altered. When the breathing pattern is ineffective, the body is most likely not getting enough oxygen to the cells. Respiratory failure may be correlated with variations in respiratory rate, abdominal and thoracic pattern. Breathing pattern alteration may also transpire in a number of circumstances from heart failure, hypoxia, airway obstruction, diaphragmatic paralysis, infection, neuromuscular impairment, trauma or surgery resulting in musculoskeletal impairment and/or pain, cognitive impairment and anxiety, diabetic ketoacidosis, uremia, thyroid dysfunction, peritonitis, drug overdose, AIDS, acute alcohol withdrawal, cardiac surgery, cholecystectomy, liver cirrhosis, craniocerebral trauma, disc surgery, lymphomas, renal dialysis, seizure disorders, spinal cord injuries, mechanical ventilatory assistance and pleural inflammation. Having a clear and effective airway is vital in patient care. Appropriate management for patients with oxygenation difficulties are to sustain or enhance pulmonary ventilation and oxygenation, promote comfort and ease of breathing, improve ability to participate in physical activities, and to prevent risks associated with oxygenation problems such as skin and tissue breakdown, syncope, acid-base imbalances, and feelings of hopelessness and social isolation. The following are the common goals and expected outcomes for Ineffective Breathing Pattern. Patient maintains an effective breathing pattern, as evidenced by relaxed breathing at normal rate and depth and absence of dyspnea. Patient’s respiratory rate remains within established limits. Patient’s ABG levels return to and remain within established limits. Patient indicates, either verbally or through behavior, feeling comfortable when breathing. Patient reports feeling rested each day. Patient performs diaphragmatic pursed-lip breathing. Patient demonstrates maximum lung expansion with adequate ventilation. When patient carries out ADLs, breathing pattern remains normal. 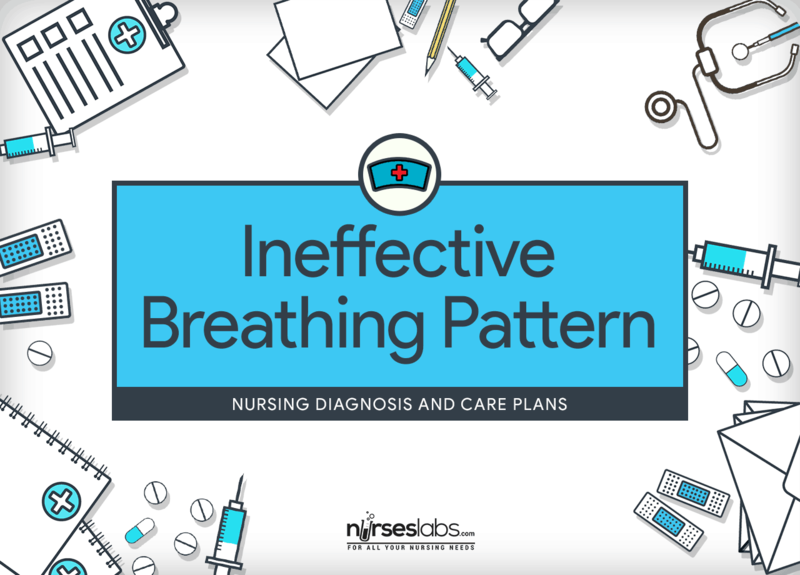 Continuous assessment is necessary in order to know possible problems that may have lead to Ineffective Breathing Pattern as well as name any concerns that may occur during nursing care. Assess and record respiratory rate and depth at least every 4 hours. The average rate of respiration for adults is 10 to 20 breaths per minute. It is important to take action when there is an alteration in the pattern of breathing to detect early signs of respiratory compromise. Assess ABG levels, according to facility policy. This monitors oxygenation and ventilation status. 1. Note the pH. Determine if it is acidosis or alkalosis. 2. Note the PaCO2. Is it normal, increased, or decreased? 3. Note the HCO3. Is it normal, increased, or decreased? 4. Note the base. Excess or deficit? 5. Note the PaO2. To determine if there is hypoxia. Observe for breathing patterns. Unusual breathing patterns may imply an underlying disease process or dysfunction. Cheyne-Stokes respiration signifies bilateral dysfunction in the deep cerebral or diencephalon related with brain injury or metabolic abnormalities. Apneusis and ataxic breathing are related with failure of the respiratory centers in the pons and medulla. Coarse crackle sound that is wetter than a rale, suctioning recommended. Ask if they are “short of breath” and note any dyspnea. Sometimes anxiety can cause dyspnea, so watch the patient for “air hunger” which is a sign that the cause of shortness of breath is physical. Assess for use of accessory muscle. Work of breathing increases greatly as lung compliance decreases. Monitor for diaphragmatic muscle fatigue or weakness (paradoxical motion). Paradoxical movement of the abdomen (an inward versus outward movement during inspiration) is indicative of respiratory muscle fatigue and weakness. Observe for retractions or flaring of nostrils. These signs signify an increase in respiratory effort. Assess the position that the patient assumes for breathing. Orthopnea is associated with breathing difficulty. Utilize pulse oximetry to check oxygen saturation and pulse rate. Pulse oximetry is a helpful tool to detect alterations in oxygenation initially; but, for CO2 levels, end tidal CO2 monitoring or arterial blood gases (ABGs) would require being obtained. Inquire about precipitating and alleviating factors. Knowledge of these factors is useful in planning interventions to prevent or manage future episodes of breathing problems. Assess ability to mobilize secretions. The incapability to mobilize secretions may contribute to change in breathing pattern. Observe presence of sputum for amount, color, consistency. These may be indicative of a cause for the alteration in breathing pattern. Send specimen for culture and sensitivity testing if sputum appears to be discolored. This may signify infection. Evaluate level of anxiety. Hypoxia and sensation of “not being able to breathe” are frightening and may worsen hypoxia. Note for changes in level of consciousness. Restlessness, confusion, and/or irritability can be early indicators of insufficient oxygen to the brain. Evaluate skin color, temperature, capillary refill; observe central versus peripheral cyanosis. Lack of oxygen will cause blue/cyanosis coloring to the lips, tongue, and fingers. Cyanosis to the inside of the mouth is a medical emergency! Assess for thoracic or upper abdominal pain. Pain can result shallow breathing. Keep away from high concentration of oxygen in patients with chronic obstructive pulmonary disease (COPD). Hypoxia triggers the drive to breathe in the chronic CO2 retainer patient. When administering oxygen, close monitoring is very important to avoid hazardous risings in the patient’s PaO2, which could lead to apnea. Evaluate nutritional status (e.g., weight, albumin level, electrolyte level). Malnutrition may result in premature development of respiratory failure because it reduces respiratory mass and strength. Place patient with proper body alignment for maximum breathing pattern. A sitting position permits maximum lung excursion and chest expansion. These techniques promotes deep inspiration, which increases oxygenation and prevents atelectasis. Controlled breathing methods may also aid slow respirations in patients who are tachypneic. Prolonged expiration prevents air trapping. Encourage diaphragmatic breathing for patients with chronic disease. This method relaxes muscles and increases the patient’s oxygen level. Evaluate the appropriateness of inspiratory muscle training. This training improves conscious control of respiratory muscles and inspiratory muscle strength. Provide respiratory medications and oxygen, per doctor’s orders. Beta-adrenergic agonist medications relax airway smooth muscles and cause bronchodilation to open air passages. Avoid high concentration of oxygen in patients with COPD. Hypoxia triggers the drive to breathe in the chronic CO2 retainer patient. When administering oxygen, close monitoring is very important to avoid uncertain risings in the patient’s PaO2, which could lead to apnea. Maintain a clear airway by encouraging patient to mobilize own secretions with successful coughing. This facilitates adequate clearance of secretions. Suction secretions, as necessary. This is to clear blockage in airway. Stay with the patient during acute episodes of respiratory distress. This will reduce the patient’s anxiety, thereby reducing oxygen demand. Ambulate patient as tolerated with doctor’s order three times daily. Ambulation can further break up and move secretions that block the airways. Consult dietitian for dietary modifications. COPD may cause malnutrition which can affect breathing pattern. Good nutrition can strengthen the functionality of respiratory muscles. Encourage small frequent meals. This prevents crowding of the diaphragm. Help patient with ADLs, as necessary. This conserves energy and avoids overexertion and fatigue. Avail a fan in the room. Moving air can decrease feelings of air hunger. Encourage social interactions with others that have medical diagnoses of ineffective breathing pattern. Talking to others with similar conditions can help to ease anxiety and increase coping skills. Educate patient or significant other proper breathing, coughing, and splinting methods. These allow sufficient mobilization of secretions. Educate patient about medications: indications, dosage, frequency, and possible side effects. Incorporate review of metered-dose inhaler and nebulizer treatments, as needed. This information promotes safe and effective medication administration. These measures allow patient to participate in maintaining health status and improve ventilation.